Hey, be quiet! Caesar is speaking. Stand directly in front of Antonius' place while he's running this race. Antonius! Antonius, don't forget in the rush of the race to touch Calpurnia. The wise old men say that the infertile women will be cured of their infertility by the touch of a runner in this race. I'll definitely remember. Whenever Caesar tells someone to do something, it gets done. Then proceed, and don't leave out any part of the ceremony. When Caesar says 'Do this', it is performed. Bid every noise be still. Peace yet again! Cry 'Caesar!' Speak. Caesar is turned to hear. Everyone, be still. Be quiet yet again! Who's calling me from the crowd? I hear some voice that's more shrill than any music calling "Caesar!" Speak. Caesar is ready to hear you. Beware the 15th of March. A soothsayer is telling you to beware the 15th of March. Bring him before me. Let me see his face. Come out of the crowd, fellow. Look at Caesar. What are you going to say to me now? Speak once again. Just some dreamer. Let's leave him. Proceed on. Fellow, come from the throng. Look upon Caesar. Are you going to see the results of the race? I'm not very interested in games. I lack that outgoing spirit that Antony has. Don't let me stop you from going, Cassius. I'll leave you now. Brutus, I've been observing you lately, and I feel like you haven't been as friendly to me as you always used to be. You've been acting cool and distant to your friend who loves you. Let me not hinder, Cassius, your desires. Cassius points out to Brutus that he has been acting distant and formal by using a metaphor from horse riding. With a horse you know well, you keep a loose hand over the reins; but with strange horse, the rider keeps a stubborn, or firm, hand over the reins. Cassius, don't misunderstand me. If I've hidden my feelings, it's because I've kept my troubles to myself. Lately I've been plagued with some conflicting emotions—just a personal problem—and I suppose this has affected my behavior. But I don't want to upset my good friends—and Cassius, you are certainly one of them—nor do I want my friends to suppose that my neglect stems from anything other than that I'm fighting my own internal battles and have forgotten to show how much I love them. Well in that case, Brutus, I very much misunderstood your mood. As a result, I've been keeping to myself some important thoughts I think I should discuss with you. Tell me, Brutus, can you see your own face? Which give some soil, perhaps, to my behaviors. No, Cassius, since eyes can't see themselves except in reflections from other things. That's very true. And everyone thinks it's really too bad, Brutus, that you have no mirror that would allow you to see your own worthiness with your eyes. I've heard many of the most respected men in Rome—not including that immortal Caesar—talk about you, and bemoaning the oppressive times we're living in, and wished you could have their eyes to see your own greatness. What kind of political danger are you leading me into, Cassius? Why do you want me to search inside myself for something that isn't there? Therefore, good Brutus, be prepared to hear. Well, good Brutus, prepare to hear me explain. Since you can't see yourself except by a reflection, I'll act as your mirror and allow you to discover parts of yourself you don't know about yet in a modest way. And don't be suspicious about me, gentle Brutus. If I were known to be a joker; or I made my oaths meaningless by swearing my love to anyone who claimed to be a friend; or if I sucked up to people and hugged them, then later bad-mouthed them; or if I claimed to be every loser's best friend after a few drinks; then you'd have reason to suspect me of bad motives. What's the meaning of this shouting? I'm afraid the common people might be choosing Caesar to be their king. And be not jealous on me, gentle Brutus. To all the rout; then hold me dangerous. Are you afraid of that? Then I assume you wouldn't want it to happen. I would not, Cassius, although I like Caesar very much. But why have you kept me here for so long? What is it you want to tell me? If general welfare of Rome is at stake, I would as soon lose my life as my honor. Let the gods assist me as I love my honorable name more than I fear death. Brutus, I know that you have honor inside you as well as I know your face. Well, honor is what I want to talk to you about. I don't know what you and other men think, but as for me, I'd rather be dead than be forced to live in awe of a leader who's just another man like myself. I was born just as free as Caesar, and so were you. We have had as healthy a diet, and can endure the cold as well as he can. Once, on a really blustery day, when the Tiber river was almost flowing over its banks, Caesar asked me "Do you dare, Cassius, to leap into the rough high waters with me and swim to that point over there?" As soon as he said it, I dove in with all my clothes on, and signaled for him to follow me, which he did. Endure the winter's cold as well as he. The torrent of water was roaring, and we fought the waters aside with our vigorous limbs, cutting through it thanks to our stalwart hearts. But before we could get to the point agreed on, Caesar yelled "Help me, Cassius, or I'm going to drown!" I carried Caesar on my back from the Tiber River just as Aeneas, the eventual founder of Rome and ancestor of all the Romans, carried his father Anchises to safety on his back from the burning city of Troy at the end of the Trojan War. And now this man I carried is treated like a god, while I'm just another wretched creature who has to kowtow to almighty Caesar if he so much as nods at me. And when we led an army into Spain against Pompey's son, he developed a fever and had a seizure. Yeah, this god lay there unconscious, shaking. How he did shake. 'Tis true, this god did shake! In Cassius' disdainful description of a very sick Caesar, you would expect him to say that the color had left Caesar's lips, which is a common symptom of illness. But Shakespeare has cleverly reversed the subject and object of the phrase in order to create another image entirely. Caesar's lips are like cowardly soldiers fleeing from their colors—the battle flag around which the soldiers should rally. The imagery conveys both Caesar's illness, and—more importantly—his lack of fortitude. His lips were pale, and those eyes of his, whose gaze inspires awe in whomever he looks upon, had lost their shine. I heard him groaning in pain, and that tongue of his that commanded the Romans to listen to his speeches and record them in their books, that tongue cried "Give me something to drink, Titinius" like a sick girl. By god, it amazes me that a man so sickly has risen above all his competitors and accumulated all the honors to himself. Another shout from the crowd! I really do think this applause is for some new honors being piled onto Caesar. Caesar is like the huge statue in the ancient city of Rhodes, which was large enough to straddle the harbor entrance, and like the puny sailing ships which passed between his legs, we are mere peons who walk beneath Caesars great legs. But men can be masters of their own fates; so my dear Brutus, it's our fault that we're Caesar's underlings. You're a "Brutus" and he's a "Caesar"—what's in the name "Caesar" that's so special? Why should people talk about Caesar more than about you? Write your two names down, and yours looks just as nice. Speak them, and yours sounds just as sweet, just as weighty. If you used these sacred names to conjure up spirits, "Brutus" would get you a ghost just as soon as "Caesar" would. 'Brutus' and 'Caesar' — what should be in that 'Caesar'? 'Brutus' will start a spirit as soon as 'Caesar'. It was commonly believed by superstitious Romans that the spirits of the dead could be conjured up by invoking the names of gods. We're familiar with the story of the great flood from the Book of Genesis, but the ancient Romans would have been familiar with an earlier Greek version of the myth. In this version, Zeus created the flood to wipe out the human race because he was disgusted by the savagery of a Greek king who had conducted a human sacrifice to the gods. The god Prometheus warned his half-human son, who was then able, like Noah, to build a boat and survive the catastrophe. Now in the names of all the gods put together, what is Caesar eating that's made him so great? This age should be ashamed of itself! Rome, you have lost your noble men. Has there ever been an age, since the great flood, in which there was only one man who rose to prominence? Is this really Rome, when there is only "room" enough in this city for one man? Everyone has heard talk of another Brutus centuries ago, who would have sooner tolerated the devil ruling in Rome than a king. In Shakespeare's day, the words Rome and room had the same pronunciation, so the internal rhyme of the line would have emphasized its meaning: "Is it really Rome when there's only room enough for one man?" Centuries earlier, a distant ancestor of Brutus named Lucius Junius Brutus led the rebellion which overthrew the oppressive Roman monarchy in order to establish the republic. According to our Brutus, his ancestor would have tolerated a devil ruling Rome before allowing Rome to be ruled by a king. He has some idea of what Cassius is getting—or aiming—at. Brutus shares Cassius' aims, his goals. I do not doubt that you love me, and I have an idea of what you're getting at, and suspect that I have similar aims. For the moment, I'm asking you as a good friend, don't try to urge me to go any further in this direction. I'll think about what you've said, I'll listen to what more you have to say, and when the time is right, we'll talk about these important matters. Until then, my noble friend, think carefully about this: I would rather be a village peasant than to be an honored Roman under the difficult conditions that I believe these times are likely to impose on us. I'm glad that my weak words have provoked thus much of a passionate response from you, Brutus. The games are over and Caesar is returning. When they come by, tug on Casca's sleeve and he'll tell you anything of note that happened today, in that sour way of his of course. Yes, I'll do that. But look, Cassius, Caesar looks very angry, and the rest of them are all trailing after him as if they've been scolded. Calpurnia looks pale, and Cicero's eyes are as fierce and fiery as they are when he's in an argument with fellow senators at the Capitol. Casca will tell us what's the matter. And all the rest look like a chidden train. I'd like to surround myself with fat, well-fed men who sleep soundly at night. But look at Cassius over there. He has a hungry look about him. He thinks too much. Men like that are dangerous. Don't fear him, Caesar, he's not dangerous. He's a noble Roman with a good feeling toward you. Quite through the deeds of men. He loves no plays. If only he were fatter! But I'm not afraid of him. Yet, if I were capable of fear, I can't think of anyone I would avoid sooner than that skinny Cassius. He reads a lot, he is very observing, and he sees through men's actions to their ulterior motives. He doesn't like plays like you do, Antony, nor does he listen to music. He rarely smiles, and when he does smile it seems like he's mocking himself for smiling at anything. Men like him are never content when they see that someone is greater than themselves, and therefore those men are very dangerous. Of course only what is normally feared rather then what I fear, for I am Caesar who fears no one. Come over to my right side for my left ear is deaf, and tell me what you really think about him. You pull'd me by the cloak. Would you speak with me? You pulled on my sleeve. Did you want to speak to me? Yes, Casca, tell us what happened today that made Caesar look so serious. Why, you were there with him, weren't you? If I had been, I wouldn't have asked you about what happened. Why, they offered him, the crown, and he pushed it away with the back of his hand like this, and then the people started shouting. What was the second big outcry about? Why, for the same thing. They shouted three times. What was the last shout for? and then the people fell a-shouting. He was offered the crown three times? Yes, indeed, and he refused it three times, each time more gently than the last, and every time he refused it the good people next to me shouted like crazy. Tell us exactly how it happened, noble Casca. Hang me if I know how it happened. It was so ridiculous I didn't pay attention. I saw Mark Antony offer Caesar a crown—well it wasn't exactly a crown, it was one of those little coronets—and like I told you, he refused it once. Still, to my mind, he would have liked to have had it. Then Antony offered it to him again, and he refused it again; but it seemed to me he was reluctant to let go of it. And then Antony offered it the third time, and Caesar refused it again; yet as he motioned to refuse it, the crowd whooped and clapped their rough peasant hands and threw their greasy hats in the air, and their stinking breath almost made Caesar choke, for he fainted. And for me, I didn't dare laugh for fear of opening my mouth and breathing in their bad breath. almost choked Caesar, for he swooned and fell down at it. But, soft, I pray you; what, did Caesar swoon? 'Tis very like; he hath the falling sickness. Hang on, please, tell us—did Caesar really faint? He fell down in the marketplace, and foamed at the mouth, and couldn't speak. That seems very plausible; he does have epilepsy, which most people call the falling-sickness. No, it's not Caesar who has the falling-sickness, but all of us—our good government is falling apart around us. I don't know what you mean by that, but I am positive that Caesar fell down. If the ragtag peasants didn't clap and boo for him just like they would in a public theater, then I'm not an honest man. "we have the falling sickness"
Comparing the health of society and its government to that of the human body was a favorite metaphor of Shakespeare's. Here, Cassius is saying that it's Rome which is suffering from the "falling sickness," because the political health of the Republic has collapsed under the dictatorship of Caesar. What did he say when he came to? Well, before he fell down, when he realized that the mob was was glad that he refused the crown, he opened his shirt and offered his own throat for them to cut. Had I been a tradesman skilled with knife, then if I hadn't taken him at his word slit his throat right there, I should have gone to hell. And then he fell. When he recovered, he said that if he had done or said anything that seemed wrong, then the crowd should blame it on his illness. Three or four women near me cried out "Alas good soul!" and forgave him with all their hearts. But that means nothing—they would have done the same even if Caesar had slept with their mothers. And after that Caesar came back looking irritated as we saw? would have done no less. Most of the culture of ancient Rome derived from the older, highly advanced Greek civilization. Roman intellectuals learned Greek and studied in the sophisticated city of Athens. Cicero has just made a disparaging comment about Caesar, which could get him in trouble if overheard by the wrong person. He spoke it in Greek so that only his intellectual friends would understand, those that "smiled at one another and shook their heads." On a related note, because medieval European culture descended directly from that of the Roman empire, a public education in Shakespeare's day was devoted almost entirely to mastering Latin and studying the ancient Roman writers. Every educated person knew Latin, but just as in Cicero's Rome, only a few intellectuals knew Greek. As a result, this expression, "It's Greek to me," was already common in Shakespeare's day. Yes, he spoke in Greek. Now if I tell you what he said, I'll be lying and I'll never be able to look you in the face again. But those who could understand him smiled at one another and shook their heads. As for me, well, it was just Greek to me. I could tell you some more news. Marullus and Flavius have been removed from there posts as tribunes for having removed the victory decorations from Caesar's statues. Farewell. There was even more ridiculous stuff, if I could only remember it. "ne'er look you i' th' face"
A moral person cannot look someone in the face when lying to them. Casca would be lying if he told Cassius what Cicero said since he doesn’t understand Greek. No, I've got other commitments. Yes, if I'm still alive, and you haven't lost your mind, and your dinner is worth eating. What a rude fellow he's grown up to be; he was very witty in school. He still is when he's involved in a noble enterprise, although he makes a show of being very sarcastic. His bluntness is like a sauce on top of his intelligence, which makes the smart things he says easier to swallow. That's true. I'll leave you for now. Tomorrow, if you want to speak with me, I'll go to your house or, if you don't mind, come to mine and I'll wait for you there. I'll do so. Till then, think about the state of things. "Wrought" is the past tense of the verb to work. And "metal" sounds like "mettle," which refers to one's strength of character. Cassius' obvious meaning is that the noble Brutus' honorable mettle, i.e. his character, can be worked upon to change how he is normally disposed (and make him more willing to conspire against Caesar). In another sense, Brutus is like one of the "noble metals," gold and silver, which can be wrought, pounded and bent—as with wrought iron to give the metal whatever shape one wishes. Well, Brutus, you are noble, but I can see that your honorable character can be shaped to do things other than what you're naturally disposed to do. That's why it's good for noble minds to only associate with other noble minds, for is there anyone so resolute that they can't be persuaded to do something less than honorable. Caesar doesn't like me, but he loves Brutus. If our positions were reversed, I wouldn't allow him to influence me against Caesar when I'm in his good graces. I'll have some notes thrown into his room tonight as though they came from several citizens, expressing the high opinion Rome has of Brutus, and subtly hinting of a concern about Caesar's ambition. And after this, let Caesar hold on tight for we'll topple him, or we're going to endure far worse days ahead. 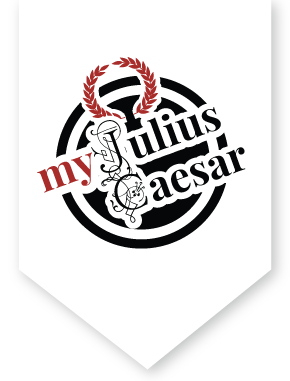 "he should not humor me"
Caesar does not care for Cassius, but he has bestowed a high government post and special favors on Brutus. Here, Cassius ponders what would happen if their positions were reversed. This statement can be read in two ways. It could mean that he (Brutus) could not convince Cassius to plot against Caesar since Cassius would be content with the benefits he had received. Alternatively, it could mean that he (Caesar) would not be able to humor Cassius with gifts since Cassius would always view Caesar as a despicable dictator. Caesar's ambition shall be glancèd at.